Cuthbert Grundy, RCA, RI, RWA, FLS, painter, author and public benefactor, donated the painting Coming Rain in November 1945, aged 99. Sir Cuthbert died in Blackpool shortly afterwards on 1 February 1946 just before his 100th birthday. Cuthbert Cartwright Grundy was born on the 10 July 1846 at Bankfield, Bury, Lancashire, the son of a successful Unitarian Bury solicitor, Thomas Grundy, and a grandson of Unitarian preacher, Edmund Grundy, who lived at Parkhills, Bury. Cuthbert would inherit not just the wealth of his family, which enabled him to devote his life to his own interests, but also the Grundy passion for education and social work driven by compassion for people, especially the poor. Indeed, a measure of the moral and political character of the Grundys is exemplified by the fact that Cuthbert’s paternal grandfather stood bail for Henry Hunt, once Preston's MP and the radical speaker and agitator jailed after the infamous 1819 Peterloo Massacre in Manchester. Edmund stood, unsuccessfully, for Parliament as a Progressive candidate in the 1832 election. Edmund was also 'a Unitarian lay preacher, and an earnest temperance worker'. The Grundy family has been traced back to 1422 and it is thought they had Scandinavian origin. Sir Cuthbert Grundy was an amateur painter of figures and landscapes, both in oil and watercolour, a campaigner for world peace, a generous benefactor of artistic, religious and philanthropic institutions and also an active advocate for the improved welfare of people. Born into inherited wealth he did not choose the idle life. Driven by his passions, he strove to use his time to make the world a better place. The first man from Blackpool to be knighted and a Freeman of his adopted town, his mark remains to this day in the eponymous town centre Art Gallery. Sir Cuthbert was educated at Stand Grammar School and Owens College (now the University of Manchester). In the latter he specialised in chemistry, botany, zoology, anatomy, physiology, literature, history, art and languages. The Lancashire Daily Post, in a 1935 interview and profile, believed this early broad education 'awakened enthusiasms which persisted and made him what he is – artist, educationist, and philosopher, both natural and speculative'. Intending to follow his father into a legal career, his time at University was cut short by an illness which the doctors blamed on 'too much reading from childhood' and 'the neglect of outdoor exercises'. The young man was actually instructed not to read for a whole year. Whilst it is possible that this unfortunate event encouraged Grundy to take up painting, it did nothing to discourage his enthusiasm for chemistry and botany. He also took up athletics and golf in his youth. which Charles Darwin was a former Fellow. Two years later, in 1870, the fruits of his continued scientific endeavour were realised when his 'An Introduction to the Study of Chemistry' was published. Grundy modestly intended that this 'little book is offered as a stepping-stone to something higher'. Reviewing it, the Manchester Guardian was moved to observe, 'such a stepping stone we believe it will prove, to all who spend a shilling in its purchase'. It became available again in 2014, after being digitised from an original copy in the British Library,144 years after its first publication. The following year saw the publication of his second book, 'Notes on the Food of Plants' (republished by General Books LLC in 2012), which prompted a description in The Graphic review as 'a most admirable little manual' and went on to suggest that 'Mr Grundy’s remarks on the deterioration in arable land should be read by all farmers'. It was also around this time that Grundy, who would become a founder member of the Blackpool branch of the League of Nations Union, conceived the idea of establishing a small international school where 'no two pupils should be of the same nation' and where they would 'live and learn together, so that they might come to appreciate that, notwithstanding their racial differences, they could work and play together; that they might return to their homes missionaries of international goodwill'. During 1871 Grundy’s life would be affected by both heroism and sadness. In the Cumbrian coastal town of Grange-over-Sands he saved two boys from drowning, for which he was awarded the Silver Medal from the Royal Humane Society, and his father died at the Grundys' house in Morecambe. Grundy continued to paint after his father’s death but it wasn’t until 1879 that he began to exhibit his landscapes. Neither he, nor his fellow artist brother, John, seems to have received any 'extended formal art training and neither appears to have regarded himself as a professional artist selling his paintings to make a living'. The brothers had inherited enough money from their father to remain amateur artists, although the two bachelors described their occupations as 'landscape painters' in the 1881 census, which found them living at Bankfield with their 75 year old widowed mother, Eliza Grundy (née Relph-Greenhow), who was born in Stainton, Westmorland, and two domestic servants, Elizabeth McKenzie (housemaid), aged 30, and Elizabeth Jones (cook), aged 22, from St Georges, Shropshire. Evidence of Grundy’s lifelong commitment to his family’s religious faith was demonstrated in June 1881 when he was elected to the Committee of the Unitarian Provincial Assembly at Lancaster. Indeed, his obituaries mentioned that he was the originator of the Wayside Pulpit, those roadside signs outside churches bearing welcoming and spiritual messages. Grundy’s liberal religious beliefs were matched by, and likely informed by, a belief and passion for liberal and progressive politics. Later that year, in October, Grundy moved a resolution concerning Ireland at the Bury Liberal Association meeting at the Phillips Hall, Bury (attended by the local Liberal MP), 'declaring the unabated confidence of the meeting in Mr Gladstone, condemning the laws under which the country is governed, and affirming their support to a policy for justice in Ireland'. This is possibly a protest against the then Prime Minister’s Irish Coercion Act of 1881, which permitted the Lord Lieutenant of Ireland to detain people for as 'long as was thought necessary' during the civil unrest, effectively suspending habeas corpus. Grundy was to receive many invitations from Liberal Associations (including Blackpool) to stand for Parliament but these overtures were always resisted in favour of his commitment to various causes and philanthropic projects. In personal letters held at Lancashire Records Office (LRO), Grundy describes his emotional turmoil upon the death of his beloved mother in 1884, writing that he 'felt that the best of my life was over'. However, he also notes 'well was it for me at this time, and ever after, that I had my brother, Jack, for my unfailing friend and helper'. Grundy now considered Bankfield, the house in Bury 'was no longer the old home' and so the brothers looked to move away, eventually choosing Blackpool, where they had previously lived, presumably renting 'some time in a furnished house in South Shore (Alexandra Road)'. When Jack married, he and his wife 'took a little house in Moore Street' and Cuthbert 'occupied one immediately opposite' (no 11). Grundy continued to be heavily involved in the art society world and in March 1886 he exhibited at the Bristol Academy. There exists a contemporary local review of his painting, which affirms that the 'delicate clearness of early morning is well expressed in Cuthbert C Grundy’s On the Sands; faithfully has the associate of the Royal Cambrian Academy conveyed the crisp dryness of the level stretch of mud coloured sand, seamed here and there with streamlets flecked with the tempered light of the morning sun; while the dark forms of the straggling fishermen give the necessary animation to what might otherwise have been a cold canvas'. Whilst not a professional artist it would seem there was a market for Grundy’s work at this time, for later that year the Liverpool Mercury announced the sale of his painting Fading Light, Langdale Pikes for £32 12s, after being exhibited for private view at Plas Mawr, Conwy. This equates to a sum of around £3,000 in today’s (2015) money. In 1888 the Grundy brothers moved to their own newly built, grand and adjoining houses in South Shore, Blackpool. Cuthbert’s eight-bedroomed house, Holmfield, 456 Lytham Road, near Broadway, was to be his home for the next 58 years until his death. This house became known as 'Grundy House' and housed the Grundy Museum until it became a private house again in 1980. The permanent move to Blackpool coincided with Grundy’s first exhibition at the Royal Academy. Two years later Cuthbert and Jack were back visiting their hometown of Bury where their works were considered some of the most notable of the 270 exhibits at the 14th annual exhibition of the Bury Society of Fine Arts at The Athenaeum. During the mid-1890s, and settled in Blackpool, Grundy continued to act upon his fervour for public benefaction, Unitarianism and art. As Chairman of the Committee managing the Industrial Exhibition to be held at the Winter Gardens in Blackpool from 24 May 1892, Grundy invited artists to contribute works; any monies raised were in aid of the 'proposed infirmary for the town'. 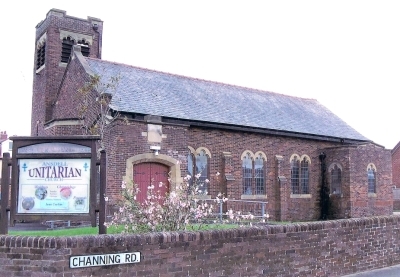 Always keen to enable worship in his faith, Grundy held the first South Shore Unitarian service in his sitting-room in Lytham Road in 1894. He acted as preacher and his brother was organist. An active member of the Management Committee of the Blackpool Sketching Club (a forerunner of today’s Blackpool Art Society), for whom he spent terms serving as President, Grundy gave the first 'chat on art and exhibition of members work' on the 14 November 1885. In June 1896 Grundy established a convalescent home for poor children at South Shore, Blackpool, giving it to the Manchester District Sunday School Association. With the 19th century drawing to a close Cuthbert had his first brush with royalty when Sir William Henry Wills visited Queen Victoria at Windsor and presented her '34 typical works' from the Bristol Academy of Fine Arts, including one from a certain C C Grundy. The dawn of the 20th century saw the Grundys step up their efforts to put Blackpool on the artistic world map, looking for a good local exhibition location and, as a result, establish their name in Blackpool permanently. In 1903 Cuthbert and John gave their collection of 33 paintings to Blackpool Town Council to 'encourage art work and to promote the establishment of a municipal art gallery in Blackpool'. By 1906 the brothers had provided a further 36 paintings for the Blackpool Art Gallery Collection and in 1908 they provided the finance, £2,000 (worth over £200,000 today), for the building costs of what became The Grundy Art Gallery. In the same year, not forgetting that an impetus for the art gallery was a place to exhibit local art, Cuthbert also donated £4 to the Blackpool Sketching Club when the balance of the Society had fallen to only 4s 6d. The Grundy Art Gallery finally opened on 26 October 1911 and, in what seems a typical act of thoughtfulness and generosity, Cuthbert personally invited all the Blackpool library staff to his residence in Lytham Road for supper and to receive 'a silver table vase as a memento of the notable day'. This invitation was prompted once Cuthbert discovered that the staff were not going to be able to take part in the official opening proceedings. An interesting observation in an essay on The Grundy Art Gallery, in 'Public Art Collections in North West England' (published 2001), was that there were only 6 works by the Grundy brothers on display at the gallery, so 'it is difficult to generalise about their style except to note that they seem to have been eclectic, as amateurs often are'. It was during this period, culminating in the opening of The Grundy Art Gallery, that Cuthbert also began moves to widen his support of his faith on the Fylde coast. Around 1904 the first meeting of Ansdell Unitarians at a private house in Lake Road took place, 'largely through the instrumentality of Mr C C Grundy, a gentleman who did yeoman service for the cause in the Fylde district. It was recognised that Mr Grundy acted like Puck in girdling the Unitarianism of the district, rather than let them live in isolation'. These efforts would ultimately culminate in Cuthbert formally opening the Unitarian Church at Fairhaven on 19 July 1930. Despite being the prime mover behind a municipal art gallery and the building of churches, the indefatigable Cuthbert also devoted his attention and time to that most elusive of human goals, the creation of world peace. In April 1911, as The Grundy Art Gallery neared its opening, Cuthbert, with Mr William Moss (a fellow JP), presented an 'extensively signed requisition' to the Mayor of Blackpool 'praying him to call a meeting to express welcome and endorsement of President Taft’s proposal' by the County Borough of Blackpool for a Treaty of Arbitration between Great Britain and the United States. This was part of the diplomatic moves to try and ensure peace after the First World War via the creation of the League of Nations. Grundy's profile, as a public figure in Blackpool and the wider country, gathered pace in the years leading up to and during the First World War. In 1913 he became President of the Royal Cambrian Society based in Conwy, North Wales. On the 13 August 1914 he was presented with a Ceremonial Key by the Corporation of Blackpool on the opening of the Public Recreation Ground and Reading Room on Highfield Road to which he was a donor. In 1915, although his dearly loved brother, Jack, died, life carried on for Cuthbert and on 16 July 1917 he signed, along with other representatives of leading art institutions, a ‘memorial’ (open letter), published in The Times, protesting about the absence of artists on the new Board managing the National Gallery of British Art (Tate Gallery). When the war was over, the country finally had the chance to thank Cuthbert Grundy for his efforts in 'public and local services' when he became the first man from Blackpool to be knighted. In his private correspondence, available at the LRO, amongst many newspaper cuttings lies a letter from the Prime Minister, Lloyd George, dated 2 August 1919, informing him that 'the King has been pleased to approve that the Honour of Knighthood be conferred upon you'. The Times made the public announcement on 13 August, King George V’s birthday, noting Grundy was President of the Royal Cambrian Art Society and a JP for the County of Lancaster. The Home Secretary introduced Grundy, then aged 73, to the King five days later when the knighthood was conferred. Later, it was reported that he travelled to London that day in a trilby hat and made the kind observation that throughout his life he mixed 'with equal pleasure with rich and poor'. That same year he became a Magistrate. On 11 January 1927 The Grundy Convalescent Home for Children was opened. Cuthbert Grundy had given money for the opening of a children’s convalescent home at 138 Stony Hill Avenue, Blackpool. The Corporation later took over the running of the home, christening the building Stonyhill Children’s Centre. He was also a generous benefactor to children's charities in both Bury and Manchester. Three years later, on 19 July 1930, he formally opened the new Unitarian Church at Fairhaven. Grundy continued to paint into his old age. In 1930, in his early 80s, he exhibited at Liverpool’s Walker Gallery and in 1933 at the annual Royal Cambrian Society's annual exhibition, a year before he retired from its Presidency. Also in 1933 a tablet, bearing an inscription in four languages, Dutch, English, French and German, was placed in the Peace Palace at The Hague, 'to record the gift of Sir Cuthbert Grundy of the commemorative medal to each of the 700 workmen who built the palace'. The fact that Sir Cuthbert was from Blackpool, England, is recorded on this tablet. There was still no relenting in his public philanthropy and in 1934 he bought land in Ambleside in the Lake District and presented it to the National Trust 'for the purpose that a lovely view should be preserved for people passing along the road'. In 1935, approaching 90 years of age, he was still a member of the Blackpool Education Committee and an indication of the esteem in which he was held, in both the fields of art and education, was that in the late 1930s the Royal Drawing Society awarded the Sir Cuthbert Grundy Challenge Shield to the school obtaining the best results in 'school examinations and Guildhall exhibition'. There are many incidents and recollections that point to the measure of the man, many documented above. One more is tucked away in his private cuttings and notes in the LRO. Cuthbert Grundy’s recreation was said to be music and at some point, just after he moved to Blackpool, Cuthbert privately wrote to the Bury Board of Guardians to offer a mechanical organ so that music could 'brighten the lives of the inmates of the workhouse'. Sir Cuthbert was finally honoured by his adopted town in 1938 when he was made Honorary Freeman of the County Borough of Blackpool. He died, a Knight, a Freeman, and above all a thoroughly decent, honourable and quietly inspirational man, just short of his 100th birthday on the 1 February 1946. Thankfully, he had witnessed the defeat of fascism and the birth of the modern Welfare State. Yet, when interviewed in 1935 he protested, 'I am not worthy of record among men who have a story to tell of the ups and downs of life, of recognition hard won, of years spent championing a cause, or satisfying an enthusiasm. I have had no difficulties to overcome; no obstacles to surmount. All has been provided for me. My voyage through life has been in calm waters, under sunny skies'. However, the Lancashire journalist who interviewed him that day sagely countered that Grundy 'could have spent his days in self-indulgent luxury, letting the unpleasant side of life go hang', a course of action he quite demonstrably did not follow. Coming Rain is one of several dark, brooding landscapes that Grundy painted in oils on canvas, mostly in the Lake District. It is quite large at 55.8 x 40.6 cm. The structure of this picture is rather unstable, as the eye follows the stream meandering round the base of the painting, disappearing behind the bush on the right, then reappearing again deeper in the middle ground, where it links the elements of the shallow and deeper picture planes with skilful perspective. This gives the work a feeling of instability, suggesting a feeling of sombre expectation of the rain in the title. This mood is further created by the dramatic sky, reminiscent of Constable’s weather studies, throwing the trees into dark silhouette. The artist uses a painterly style, with no clearly defined detail or hard edges in his subject, but with great tonal contrast of dark and light, particularly in the water of the stream which reflects the dark colours of the trees above. Grundy uses the earthy colours of the genre painter’s palette with warm reds blending with browns, greens and ochres.